The Sniper Room is the twenty-ninth level in Challenge mode in Pikmin 2. There is only one sublevel, but, as there are many enemies, it can get difficult. These enemies include Dwarf Orange Bulborbs, Snow Bulborbs, a Decorated Cannon Beetle, an Armored Cannon Beetle Larva, and a Gatling Groink. It should be noted that this level is the only one in the game series that is played at night on PNF-404, Twilight Garden being the only one played during the gloomy sundown. It is also the only level in Challenge Mode to include Foxtails or Seeding Dandelions. ↑ 1.0 1.1 The game files actually point out that another Armored Cannon Beetle Larva, carrying a Tear Stone, should appear, but it doesn't. The enemies here mostly use projectiles, hence the cave's name, so they can be used to attack each other. It is advisable to use the spray against the Groink. Treasures are spread throughout the field, and the key is well hidden. 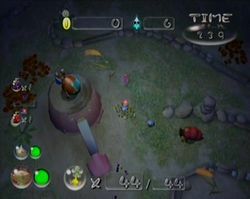 With two players, one player can distract the Groink, while the other sneaks up from behind and attacks from the shovel. This page was last edited on March 17, 2017, at 20:46.